The combination of four derivatives of testosterone. Very popular among athletes because of the long-term effects on the body. This reduces the number of injections to 1-2 per week, and the result will be no worse than similar drugs. It consists of 4 individually taken testosterones in different proportions: propionate – 36 mg, phenylpropionate – 2 mg, isocaproate – 2 mg, decanoate – 120 mg. All components are absorbed in the body with their own speed independently, but reinforcing each other. Changes in the body begin to occur immediately after the injection and last for weeks. In the Pharma Sust 300 nomenclature, the description is always monotonous, emphasizing a high anabolic effect. Although its main advantage in an integrated approach to the restructuring of the body. 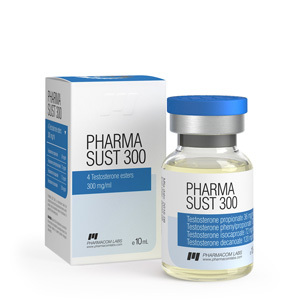 But still, Sustanon can not be considered a set of all necessary substances and during the solo course can be supplemented with other steroids. All due to the fact that the composition contains only testosterone esters. 300 mg per week at the beginning of the course is enough to start; the portion may be twice as close to the middle-end of the cycle. Those who have experience in taking such substances can go up to 900 mg for seven days. The optimal dosage directly depends on your goals and the results already available. The instructions Pharma Sust 300 how to take write the recommended period of 21-28 days. During this time you will make only 3-4 injections. This is quite enough to maintain a normal concentration of the substance in the blood. Sustanon Pharmacom price may not be repaid if you are a beginner who decided to enter a serious sport immediately with a heavy steroid. It is recommended for those who have already achieved significant success. To start it is better to turn to the same good old oxane or turinabol. Women need it when recommended by a professional trainer, and then no more than 300 mg for 10 days. We do not recommend taking oxandrolone or winstrolone with it. You will feel the effect only from Sustanol, so save your money for the next course. But the deck, trenbolone, methane is quite a good fit for the role of complementary elements, but you still need to be careful and carefully calculate the dosage. If anti-estrogens are included in the course, then the probability of side effects is minimal. At the same time, make sure that you follow all the instructions, eat properly and exercise. A healthy lifestyle and compliance with the rules – the key to obtaining success from steroids. With abuse, there is a risk of developing acne, hair loss and gynecomastia. Estrogen blockers in this case will help to normalize testosterone and avoid the consequences.